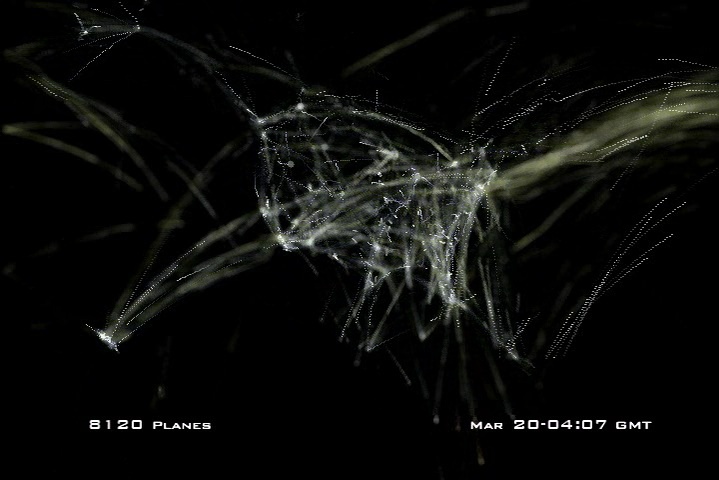 What is so incredible about this movie is that it very much resembles some of the internal workings of a cell. 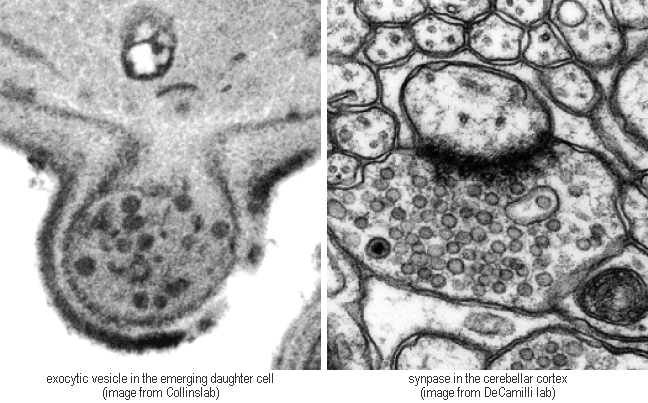 Inside a cell, there are vast amounts of intracellular traffic moving between cellular compartments (organelles). A major area of modern biological research is focused at uncovering the molecular machinery and rules that dictate traffic within the cell. The Collins lab is interested in how this intracellular traffic is controlled in time and space. One of the major classes of proteins that control membrane traffic are Rab proteins. These proteins are bound to a nucleotide and change conformation (or shape) according to whether this nucleotide is GDP or GTP. Our research seeks to uncover the molecular details of how Rab proteins function and how they regulate intracellular traffic. A fascinating feature of Rab proteins is that they are covalently modified at their COOH-terminus with two geranylgeranyl lipid modifications. 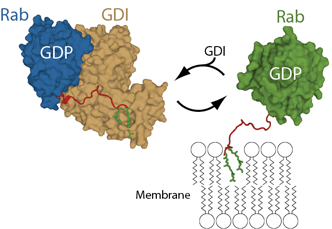 This modification enables the protein to associate with lipid bilayers. 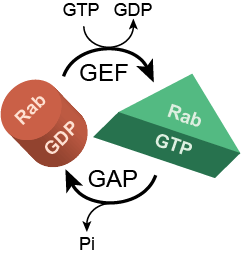 The GDP-bound Rab can partition into the cytosol with the aid of a chaperone protein called GDI. 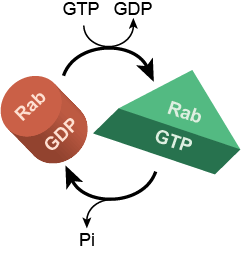 So, in addition to alternating between GDP and GTP-bound forms, Rab proteins also can cycle on and off membranes. We would like to understand the detail of how the Rab protein cycle between membranes and the cytosol is linked to their nucleotide cycle. Our lab previously identified a membrane protein called Yip1p as a protein that can bind the hydrophobic lipid tails of the Rab proteins. Yip1p is encoded by an essential gene and is functionally conserved across evolution. Research in our lab is focused on understanding the physiological function of Yip1p and related family members together with the architecture of these proteins and the molecular details of how they may influence intracellular transport events. There are many extrinsic factors that can act to govern the nucleotide cycle of Rab proteins. Some factors, such as GEFs and GAPs do this directly, binding to the Rab proteins to change the rate of nucleotide cycling. In a genetic screen to uncover new factors that can regulate Rab protein action in vivo, our lab discovered the Elp complex. The Elp complex appears to control the pathways of polarized growth in the cell that are regulated by the Rab protein Sec4p. We are very excited about this discovery and want to learn how the Elp complex functions and how this impacts polarized growth in cells. A genetic mutation in one of the proteins of the Elp complex in humans is the cause of a devastating neurological disease, Familial Dysautonomia. Given the remarkable molecular conservation between the machinery that regulates polarized growth and exocytosis in yeast on the one hand, and polarized growth and neuronal transmission in mammalian cells on the other hand; we are confident that our studies will illuminate fundamental aspects of growth control that will provide important insights into this disease in particular and neuronal function in general.